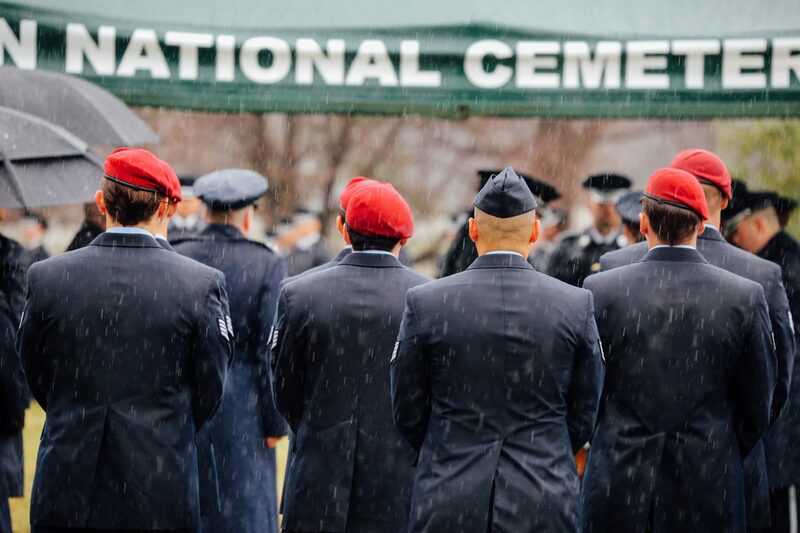 Airmen attend the funeral service for Staff Sgt. Dylan Elchin on Jan. 24, 2019, at Arlington National Cemetery. “In honor of Dylan’s legacy, may you too make the most of your God-given gifts and talents,' the chaplain told the mourners. F-15 planes flew over head. 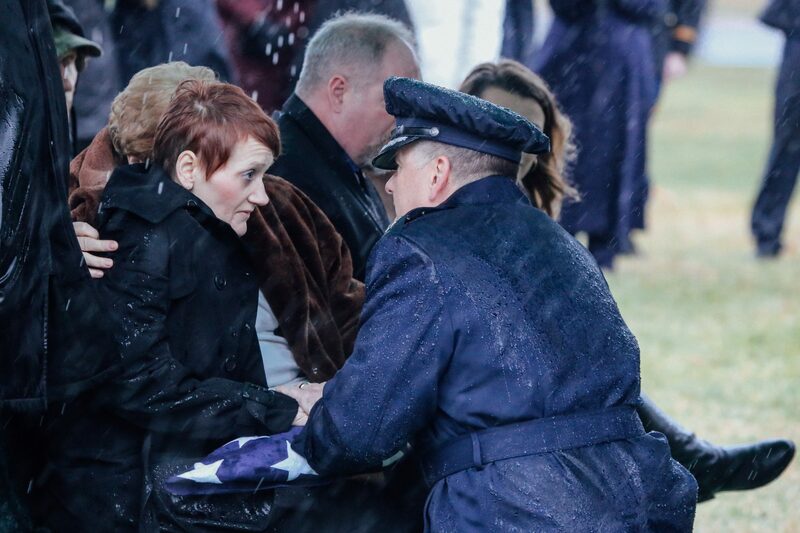 His family waited nearly two months for the funeral service at Arlington National Cemetery, so that members of his elite air tactical unit who served overseas with Elchin could attend. About 350 people gathered inside Memorial Chapel, just outside the hallowed grounds of Arlington. A larger photo of Elchin, showing him wearing fatigues and smiling, stood on a pedestal in front. The procession for Air Force Staff Sgt. Dylan Elchin of Beaver County at Arlington National Cemetery on Jan. 24, 2019. The 25-year-old was a member of an elite combat controller unit. 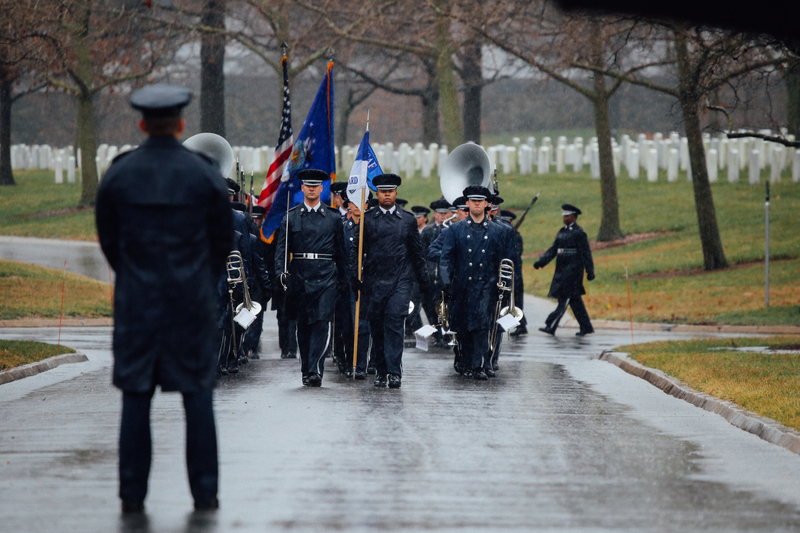 An honor guard escorts the casket of Air Force Staff Sgt. Dylan Elchin of Beaver County at Arlington National Cemetery on Jan. 24, 2019. 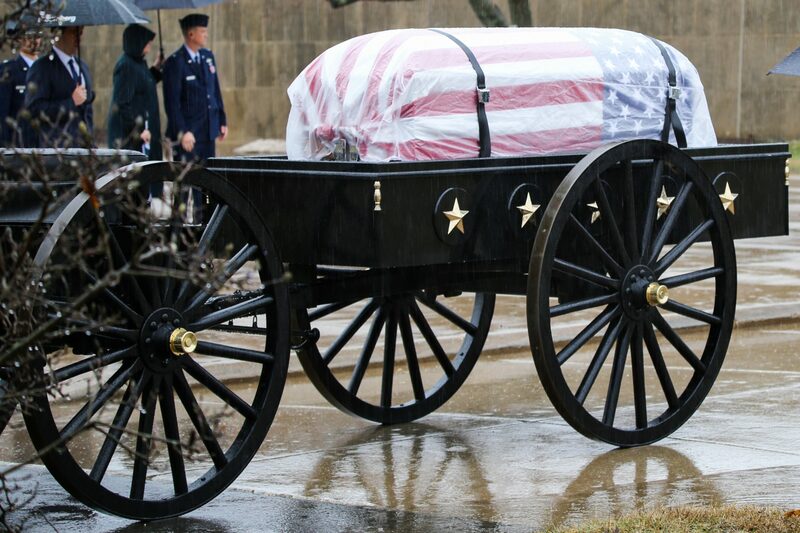 The casket of Air Force Staff Sgt. Dylan Elchin of Beaver County at Arlington National Cemetery on Jan. 24, 2019. 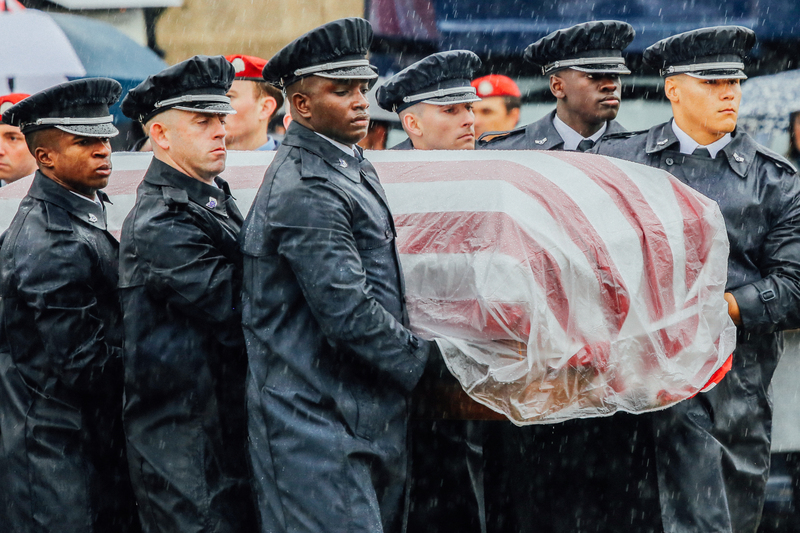 Pallbearers carry the casket of Air Force Staff Sgt. Dylan Elchin of Beaver County at Arlington National Cemetery on Jan. 24, 2019. 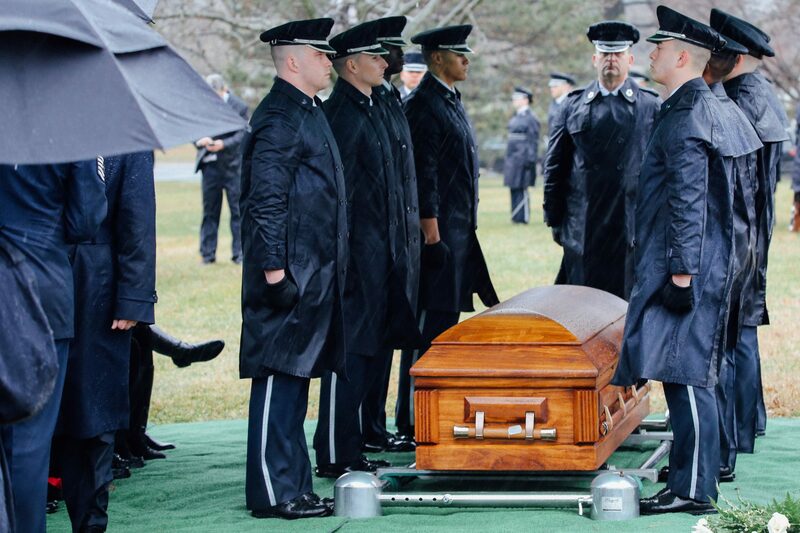 Pallbearers stand alongside the casket of Dylan Elchin on Jan. 24, 2019 at Arlington National Cemetery. The flag is folded over the casket holding Staff Sgt. 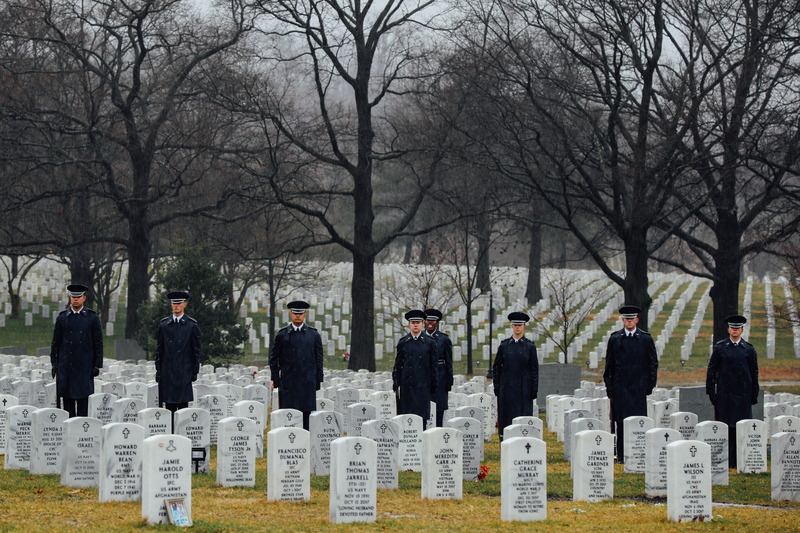 Dylan Elchin on Jan. 24, 2019, at Arlington National Cemetery. 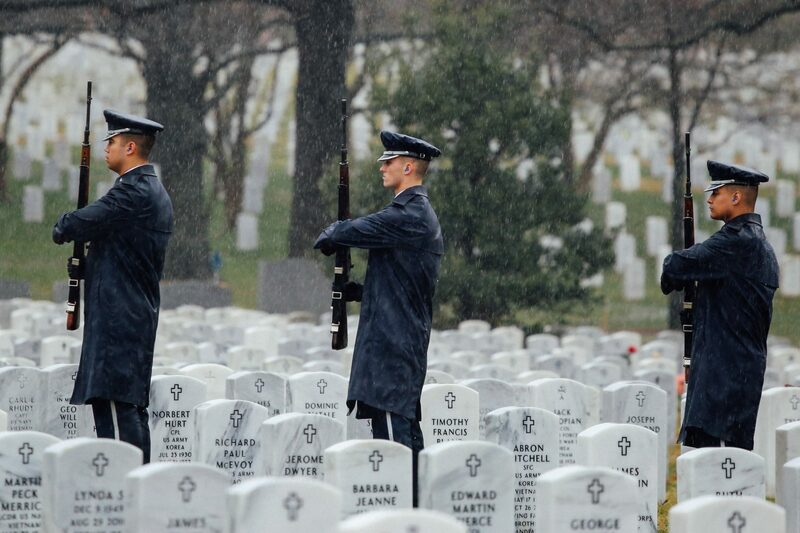 Service members prepare to fire a three-volley salute on Jan. 24, 2019 at Arlington National Cemetery. Elchin was a teenager, growing up in Beaver County, when he decided to join the military. He spent years training to become an Air Force combat controller in the 26th Special Tactics Squadron. 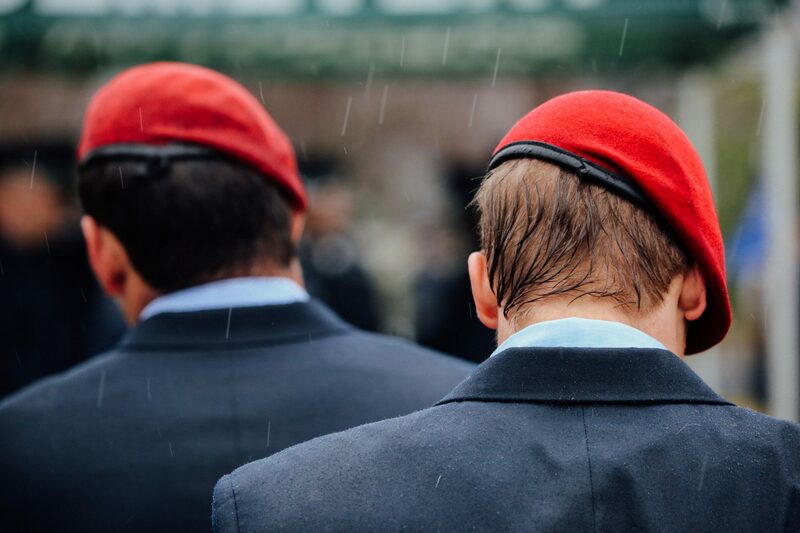 He earned the right to don the red beret of the special tactics airman. He deployed to Afghanistan in August and embedded with a special forces team. Elchin served on the ground during combat, and, during a firefight, it was his job to coordinate air strikes. He saw action early on. On Aug. 12, a convoy was pinned down and Elchin “repeatedly disregarded his own personal safety and exposed himself to enemy fire while coordinating”air strikes, according to an Air Force news release. He was awarded an Army Commendation Medal with Valor for his actions that day. Among those on hand to pay their respects Thursday was a group of family and friends who traveled from western Pennsylvania. A flag is presented to the family of Staff Sgt. Dylan Elchin on Jan. 24, 2019, at Arlington National Cemetery. At the chapel service, a fellow airman talked about how Elchin could complete any task and walk through anything with a smile. And the chaplain, Air Force Maj. Amber Murrell, talked about some of the things that made Elchin who he was: the Boy Scouts, training, camping, fishing, “just roughing it,” and the “spontaneous moments” he spent with others. She described Elchin’s decision to join the military as a decision to fight for peace. 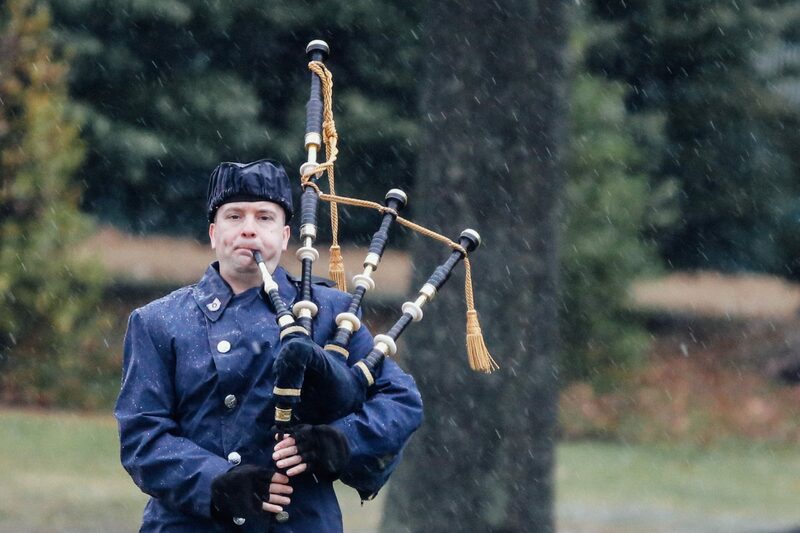 A bagpipe player performs “Amazing Grace” on Jan. 24, 2019, at Arlington National Cemetery. The service lasted about 25 minutes. Then the hundreds there headed to Section 60 of Arlington National Cemetery. 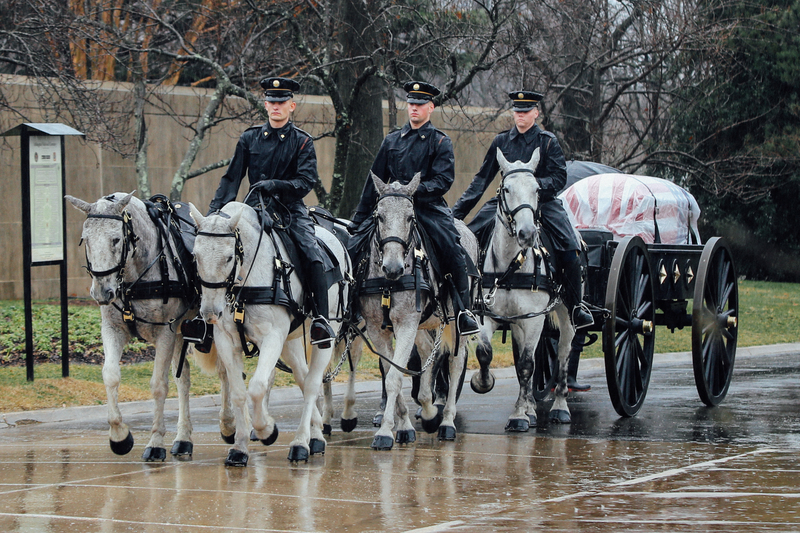 Horses pulled a caisson with the flag-draped casket. A bugler played “Taps.” Service members fired a three-volley salute. At one point, the chaplain listed a string of words to describe Elchin: someone who was a warrior, good-hearted, fearless, a clown who loved to impersonate people, dependable. And also: son, grandson, brother, fiance, brother-in-arms, friend and patriot. “In honor of Dylan’s legacy, may you too make the most of your God-given gifts and talents,” Murrell told the mourners. 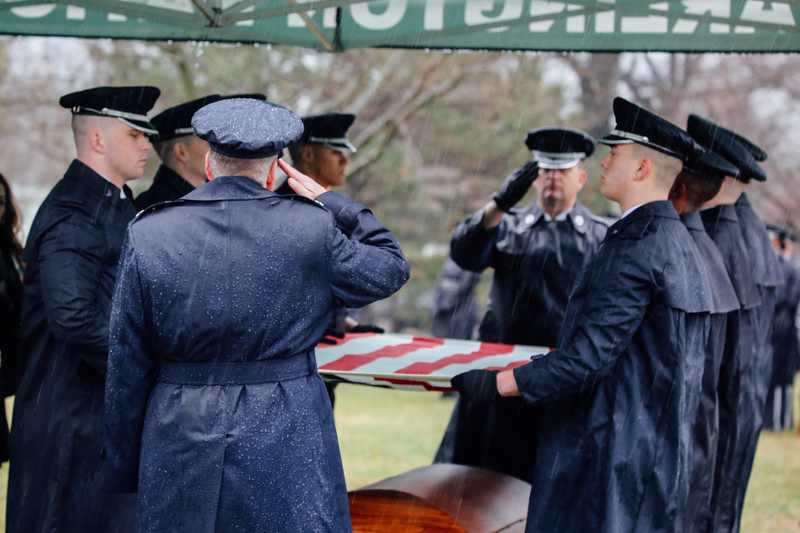 Following military tradition, Elchin’s family was presented with the U.S. flag that had draped his casket. 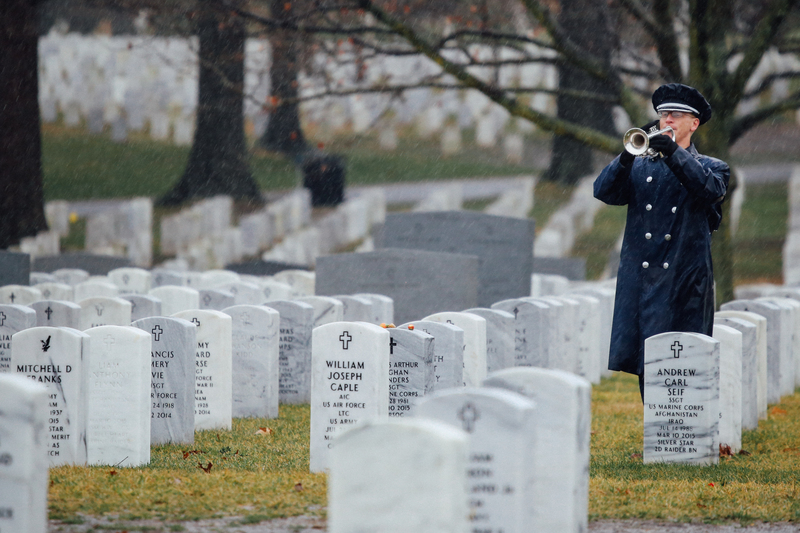 A lone bugler plays taps at Staff Sergeant Dylan Elchin’s funeral service at Arlington National Cemetery.